In 2005, Maimonides Hospital in Brooklyn, New York, unveiled a new state-of-the-art, multimillion-dollar cancer center. 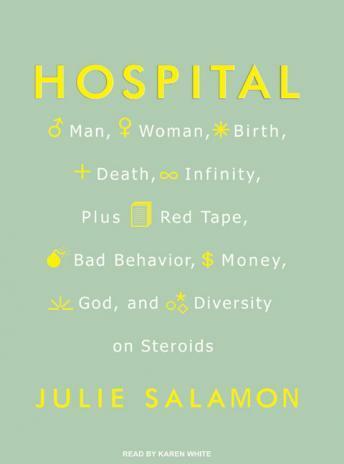 Determined to understand the whole spectrum of factors that determine what kind of medical care people receive in this country, bestselling author Julie Salamon spent one year tracking the progess of the center and getting to know the characters who make the hospital run. Located in a community where sixty-seven different languages are spoken, Maimonides is a case study for the particular kinds of concerns that arise in institutions that serve an increasingly multicultural American demographic. Granted astonishing access by the hospital higher-ups, Salamon followed the doctors, patients, administrators, nurses, ambulance drivers, cooks, and cleaning staff. She explored not just the action on the ground but also the financial, ethical, technological, socioloical, and cultural matters that the hospital commuity encounters every day. Drawing on her skills as interviewer, observer, and social critic, Salamon presents the story of modern medicine. She draws out the internal and external political machinations that exist between doctors and staff as well as between hospital and community. And she grounds the science and emotion of medical drama in the financial realities of operating a huge, private institution that must contend with such issues as adapting to the specific needs of immigrant groups that make up a large and growing portion of our society. Salamon exposes struggles both profound and humdrum: bitter internal feuds, warm personal connections, comedy, egoism, greed, love, and loss; rabbinic edicts to contend with, as well as imams and herbalists and local politicians; system foul-ups, shortages of everything except forms to fill out, recalcitrant and greedy insurance reimbursement systems, and the surprising difficulty of getting doctors to wash their hands. This is the dynamic universe of small and large concerns and personalities that, taken together, determine the nature of our care.